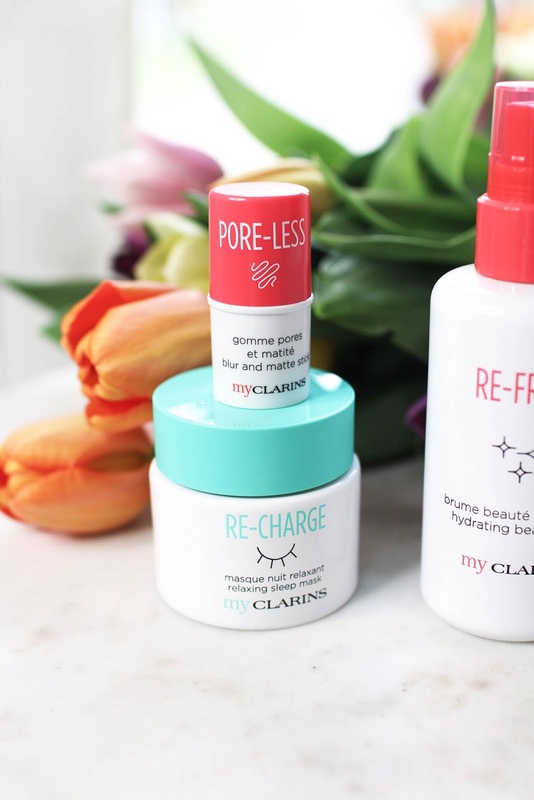 True to the motto, "nature knows it best" Clarins have developed a new skincare range for healthy-looking skin using ingredients of natural origin and vegan-friendly formulas free of sulfates and parabens. I was incredibly excited when I received these products in the mail a couple of weeks ago and have been using them religiously ever since. 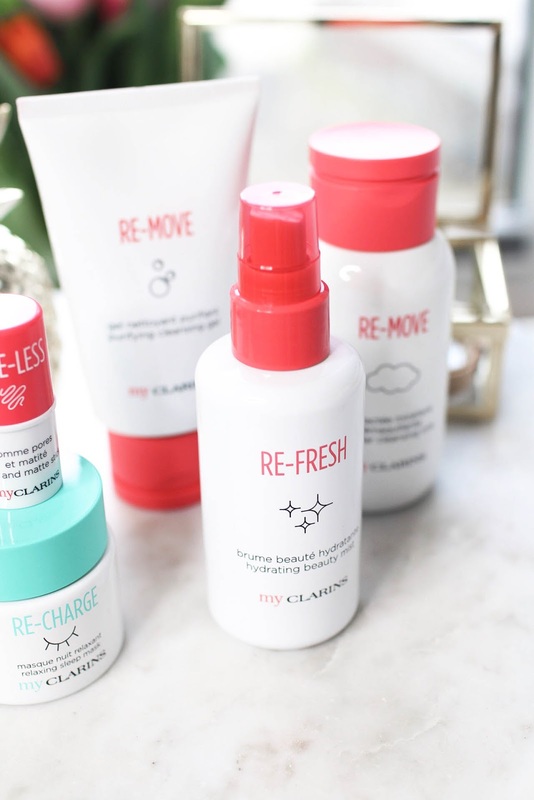 I think it's amazing that brands like Clarins strive to have a positive impact on our environment by creating products that are not only good for our skin but also for the planet. All boxes are made of cardboard derived from sustainably-managed forests while the packaging is also made of 25% recycled glass and 25% recycled plastic. My Clarins introduce nine new products covering everything you need for a fresh and healthy-looking complexion. Read on to find out more. This innovative product is a hybrid between a micellar water and a cleansing milk and removes makeup, oil and impurities like a dream. You essentially get the best of both worlds with this product, it is mild enough for sensitive skin but extremely powerful at removing makeup with its micellar technology. The formula contains a refreshing cocktail of pullution-fighting and hydrating ingredients with a lovely almond scent. Sticking to cleansers, Clarins also introduce a fresh and floral cleansing gel that transforms into a silky lather once you mix it with water. This frosted blue gel cleanser is perfect for double cleanse and really gets rid of any excess oils and makeup residues. I like that the formula doesn't dry out my skin like most gel cleansers do, instead helps to protect the skin from the drying effects of hard water. The next step in my skincare routine after cleansing is applying a hydrating facial mist. That's why I was so excited to find out that My Clarins included this floral beauty water in the range. The formula contains a wonderful cocktail of softening and hydrating ingredients, comprised with organic coconut water and Alpenrose extract to flush out toxins and pollutants. I like that this mist doesn't contain any alcohol, they even say it's gentle enough to spritz over your eyes. PORE-LESS blur and matte stick. Another super innovative product is this little pink, oil-absorbing stick, which is just perfect for my oily skin. The formula contains matifying Organic Strawberry Tree Fruit extract that blurs pores and takes down shine for a visibly smooth complexion. This stick glides over the skin with a clear finish and has a sweet, cotton candy scent to it. It's such a handy little product to keep in your hand bag for any touch-ups throughout the day. Lately I've been really into overnight skin treatments as they do a great job at protecting and nourishing the skin while you sleep. This herbal overnight mask recharges your skin's batteries and you will wake up with the most radiant and refreshed-looking skin by morning. It has a lovely cream-gel formula, that feels super comfortable on the skin with a slight fragrance with notes of Jasmine. Will you pick up anything from My Clarins?